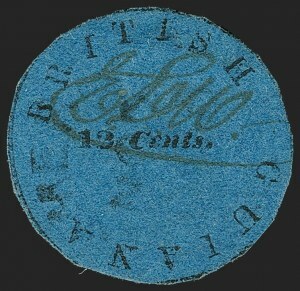 FINE AND DESIRABLE USED EXAMPLE OF THE 1850 12-CENT BLACK ON BLUE "COTTON REEL" -- ONE OF THE ICONIC RARITIES OF THE WORLD. 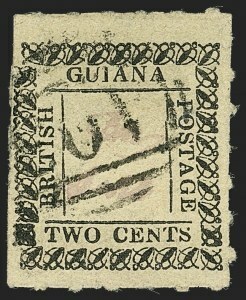 The first stamps of British Guiana were issued in July 1850, in denominations of 2c, 4c, 8c and 12c. 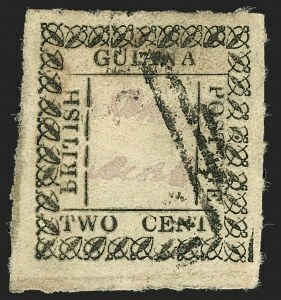 They were printed at the offices of the Royal Gazette of British Guiana newspaper. 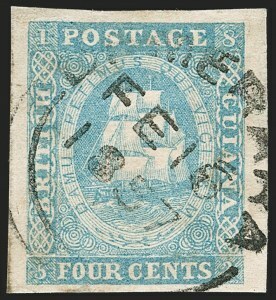 Quickly produced from printer’s type and a printer’s rule bent into a crude circle, the stamps earned the nickname “Cotton Reel” from collectors because they look similar to labels on the wooden ends of a reel of cotton thread. 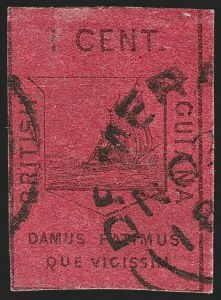 Each stamp was initialed as a control to prevent either theft or counterfeiting. 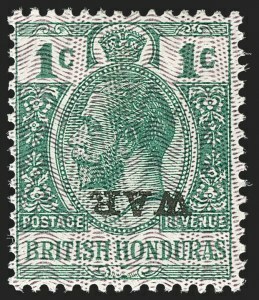 The “E.D.W.” initials of Edmond D. Wight also appear on the famous One-Cent Magenta British Guiana stamp. VERY FINE. 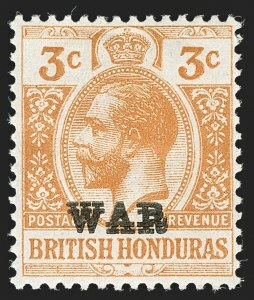 ONE OF THE FINEST OF THE SMALL NUMBER OF COVERS KNOWN WITH THIS STAMP. 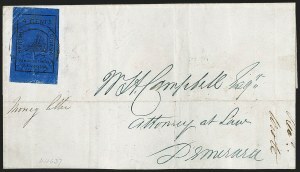 With undated R.P.S. certificate. A lesser quality example realized €43,000 in the 2014 du Pont sale. 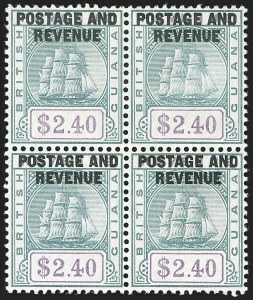 The Stanley Gibbons catalogue, reflecting the rarity of this classic stamp on cover, assigns a multiplier "from 3x" the £12,000 used value off cover. 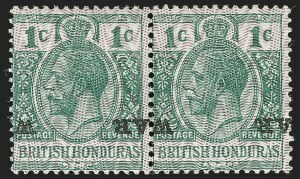 VERY FINE EXAMPLE OF THE RARE CAYE SERVICE LOCAL POST ISSUE. IT IS BELIEVED ABOUT A DOZEN COVERS ARE KNOWN. Around 1892 a Belize merchant named Cuthbert built a house on St. George's Cay. 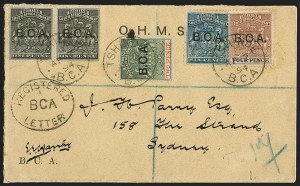 He also bought a steam yacht which sailed daily to and from Belize. 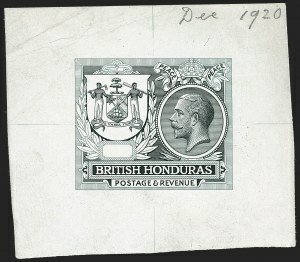 After abuse of the free service by others on the caye, who expected their mails to be carried free of charge, he created this local typewritten stamp (the cost of producing dies and normal stamps was prohibitive). 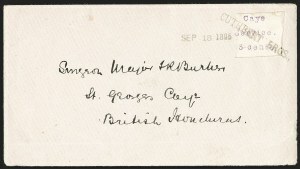 These labels are known used between July 28, 1894 and Sept. 27, 1895. Hurt and Williams record only 8 examples though a few others have appeared for sale.